Stormland was Helgason’s first contemporary novel since 101 Reykjavik. Set in North Iceland, in the small town of Sauðárkrókur, it tells the story of Böddi, Böðvar H. Steingrímsson, an angry blogger in the countryside, who dreams about a revolution and the complete overhaul of the western capitalist system. When marketing the novel, the publisher called him: “Too intelligent for the village, too angry for the city, too frank for his country.” Soaked in German literature, philosophy and romantic idealism à la Nietzsche, after his years of study in Berlin, he finds it hard to fit into his old and very small home town. Böddi is the guy who never makes compromises. Living with his lonely mother, the TV addict, he loses his teaching job on the first page, his love midway and his mind at the end of the book. Stormland was written at the height of the boom and bubble years in Icelandic history, when the nation had completely lost itself in the materialistic craziness that led up to the big financial Crash in 2008. The book became a bestseller in Denmark. 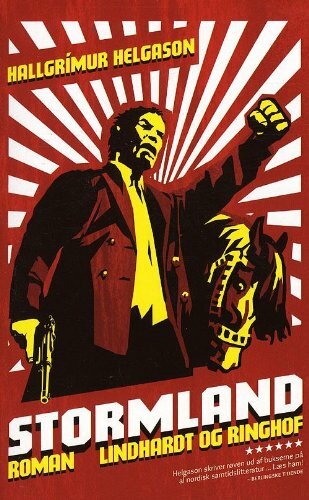 A movie, Stormland, based on the novel, was released in Iceland in 2009. It was written and directed by Marteinn Thorsson, and starring Ólafur Darri Ólafsson in his first leading film role. His performance earned him an Edda Award for Best Actor. Stormland was nominated for the Nordic Council Literature Prize in 2007. The book was nominated to the Icelandic Literary Prize in 2005. Has been published in Danish, Norwegian, Swedish and German.